Performing straightforward ion chromatography and don’t need all the advanced features? With 20 different versions available, the 930 compact IC brings true flexibility. The new compact ICs are ideal for users in all fields with clearly defined analytical requirements. These instruments ensure the rapid and safe determination of anions, cations and polar substances in the parts per billion (ppb) to the percent (%) range. The MagIC Net™ chromatography software controls all system components and monitors all parameters that are relevant to the chromatographic analysis. The compact systems feature space-saving footprint & compact design, excellent price-performance ratio and comply with all GLP and FDA requirements. The anion ICs come with a suppressor housing which can be used for high capacity, regular or low capacity rotors. 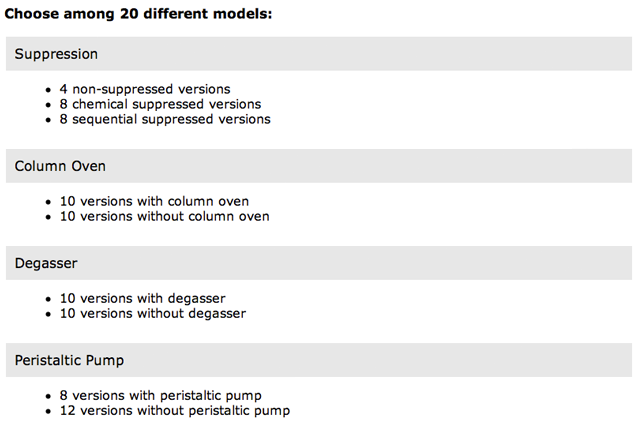 The new generation ICs also feature STREAM, Suppressor Treatment with Reused Eluent After Measuring. This will eliminate the need to add DI water for suppressor rinsing. With the new generation, you can also have a peristaltic pump or a dosino for suppressor regeneration. This generation also provides you with a degassing and column heater option. In addition, our Compact 883 Basic IC has the best price/performance ratio and is excellent for teaching and routine monitoring. The system comes with MagIC Net™ Basic software and MSM chemical suppressor. 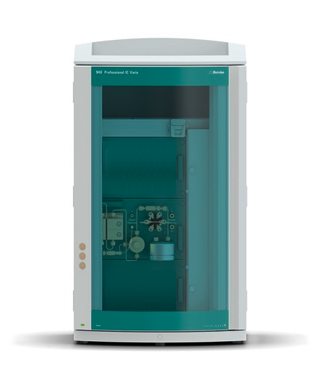 With its small, intelligent ion chromatograph, Metrohm is making available an exceptionally inexpensive instrument that enables not only schools, universities and institutes of further and advanced training, but also in-house training laboratories to acquire one or more ion chromatographs and to equip the training rooms with the required workplaces. The associated practical textbook conveys the basics of ion chromatography in a clear manner. It presents the theory not only at a simple level but also at a sophisticated one, and describes in addition 22 experiments that cover the entire world of ion chromatography for the student. With the 883 Basic IC plus, students have an instrument available to them with which they can become familiar with the fundamental principles of ion chromatography in a simple manner. Because of the fact that ion chromatography is part of the HPLC family, the fundamentals of this analysis technique are also learned. Individualized methods can be developed and saved for each experiment, by each student and for each application. The 883 Basic IC plus naturally does not restrict itself to education, but rather also accomplishes standard applications in the analytical laboratory. 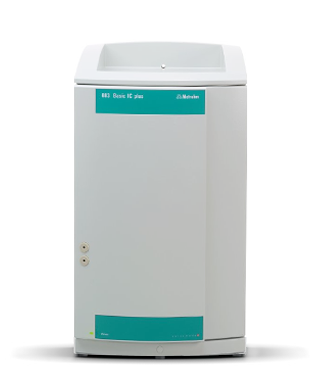 Whether anions or cations need to be analyzed or organic acids are scheduled for determination – the 883 Basic IC plus provides repeatable and accurate results in the shortest of times. As is the case with all intelligent ion chromatographs from Metrohm, the 883 Basic IC plus is also equipped with the intelligent modules (iPump, iDetector, iColumn) and with the Metrohm Suppressor Module "MSM" and an injector. The separation column is operated at room temperature in the enclosed interior chamber of the instrument. The 883 Basic IC plus can be automated with a 863 Compact IC Autosampler. It goes without saying that the MagIC Net Basic software is part of the instrument and does not need to be paid for extra.